Plan of Improvements of Duane St. Park. 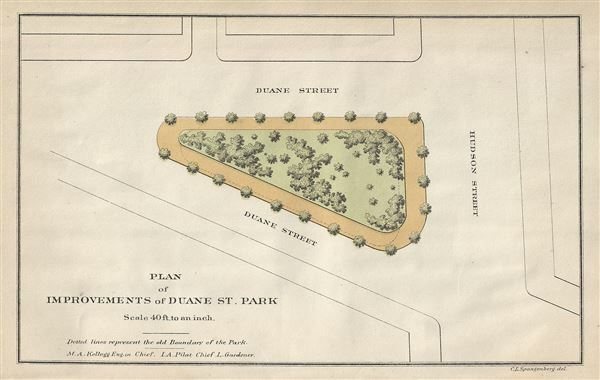 This is a scarce 1871 map of the Duane St. Park of Duane Park in New York City by Kellogg and Pilat. It shows the plans of improvements to the park located between Duane Street and Hudson St. The location of trees and shrubbery is noted within the triangular park. Duane Park was named after James Duane, the first mayor of New York after the Revolutionary War. In 1797, the city purchased the park, then part of farm called Dominie's Bouwery (minister's farm), from the Trinity Church for five dollars in order to create a public park, making Duane Park the first public space acquired by the city specifically for use as a public park. The plans of Kellogg and Pilat would turn the open commons into an enclosed green space. In 1887, famous landscape architect Calvert Vaux along with parks Superintendent Samuel Parsons Jr. would redesign this park to include paths within the space. The basic plan, trees and plants, would however remain the same. Over the years the park design saw minor changes, but even today the original design can still be recognized.